Ethan Hawke is an American actor, director, screenwriter and novelist. His breakthrough role occurred in 1989 when he portrayed the shy Todd Anderson in the film Dead Poets Society. The film went on to be nominated for numerous awards and winning more than a few including the Academy Award for Best Original Screenplay and the BAFTA Award for Best Film. Ethan Hawke has since been nominated for a number of awards which at the time of this writing included four Academy Award nominations. He has also appeared on Broadway where he earned a Tony Award nomination for Outstanding Director of a Play for directing Sam Shepard’s A Lie of the Mind. Ethan Hawke is a direct descendant of Mayflower passenger Stephen Hopkins and of Robert de Ros, a Magna Carta surety. His family tree also includes members of the royal family including Queen Elizabeth II, the late Princess Diana, Duchess of York Sarah Ferguson, and a couple of wives of King Henry VIII, Anne Boleyn and Catherine Howard. 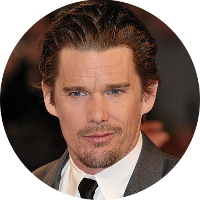 Ethan Hawke also has kinship to a number of former U.S. Presidents including Thomas Jefferson, Millard Fillmore, Franklin Pierce, Ulysses S. Grant, Rutherford B. Hayes, William H. Taft, Calvin Coolidge, Franklin D. Roosevelt, Richard Nixon, Gerald Ford, and both Presidents Bush. Some of his fellow celebrities in his family tree include Carole Lombard, William H. Macy, Paget Brewster, Clint Eastwood, Kevin Bacon, Christopher Lloyd, Orson Welles, and Shirley Temple. Fellow literary kin include Tennessee Williams, Nathaniel Hawthorne, Henry Wadsworth Longfellow, Clement Clarke Moore, Edmund Waller, Emily Dickinson, Walt Whitman, Ray Bradbury, and Helen Keller.